Spring has come and at Innovative Polymers we have all sorts of projects “blooming”! One of the most exciting announcements is the availability of our new Innovative Polymers Processing Guide. Several years in the making, the colorful, 24-page, magazine-like guide contains comprehensive information about handling polyurethanes. A full variety of techniques and best practices are included along with trouble-shooting and health/safety/storage sections. 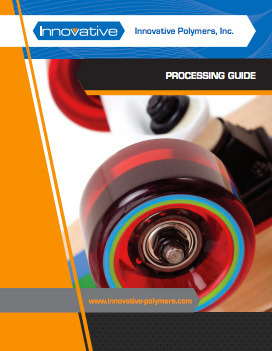 The Processing Guide can be downloaded from our website at www.innovative-polymers.com. We’ve also produced a video on casting polyurethanes. It contains important tips about weighing and mixing that are key to producing high-quality parts. Like the Processing Guide, the video link is on our home page. Click here to watch the video. Please take time to look at both the Guide and video…we hope that they will quickly become a favored resource to answer questions that arise as you work with our products. Our technical support team also remains just a phone call away at 800-340-4563. Our newest addition to the InnoTuf ® product line promises to become a customer favorite for building robust, ABS-like parts. It has a water-like viscosity and easy-to-handle 1:1 resin to hardener mix ratio by volume. It is ideal for hand-casting as well as vacuum casting and meter-mix dispensing. Gel time is three minutes and demold time about 30 minutes. High notched Izod impact strength of 1.6 ft.-lbs./in. We are expanding our presence at a variety of industry trade shows this year. In February, we exhibited at the Pipeline Pigging and Integrity Management Conference (PPIM) in Houston. At the show, we met with folks from all over the globe, including Canada, Mexico, France, the Netherlands, Columbia, Nigeria, Peru and South Korea, as well as throughout the U.S. These customers and potential customers learned about the capabilities of polyurethanes that have long been appreciated by the molders who cast high durability parts used in automobiles, mining, architectural fascia, equipment housings and recreational product applications. Like many of our products, the polyurethanes we supply to the oil field services industry are formulated by Innovative Discs and cups from pipeline pigs Polymers chemists to stand up to performing in the challenging oil-field environment. Last month, we participated in the Association of Professional Model Makers Conference (APMM) in Greenville, SC. It’s a biennial show that offers model makers an opportunity to learn more about the latest materials and methods to support their craft and learn from workshops designed to solve real-world challenges unique to the model making industry. Innovative Polymers enjoyed meeting with old customers and new contacts to discuss our full line of easy-to-handle polyurethanes. March also included our exhibiting at the 34th annual Michigan Taxidermist Association Convention and Competition in Grand Rapids. Did you know that Innovative Polymers is a leading supplier of polyurethanes used as animal bodies, heads, eyes, feet and fins in taxidermy? A number of our customers are known world-wide for their artistic creations. 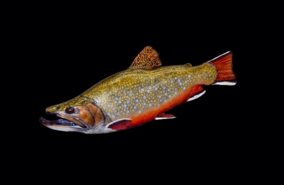 As with our customers in many industries, the taxidermists frequently rely on our technical team for special processing guidelines to obtain award-winning results. This month, Innovative Polymers is holding a two-day workshop on silicone molding and polyurethane casting at the Additive Manufacturing Users Group (AMUG) in St. Louis, MO, Booth #39. There is renewed interest in creating multiple prototypes in a mold built using a master pattern generated via stereolithography. As long-time experts in building functional prototypes and parts in silicone tooling, we look forward to sharing some tips on the process and our latest products. May 16-19, we’ll be in Orlando, FL for Rapid 2016 where we will exhibit our full range of polyurethanes for casting prototypes as well as functional parts at Booth #760. If you are attending any of these shows, please leave time to visit our booth. If you won’t see us at an industry event, remember we’re just a phone call or e-mail away. We love to discuss project challenges and ways that the team at Innovative Polymers can help!